You will have seen countless pictures of Rainbow Mountain on Instagram and, if you’re already in Cusco, its unmistakable seams of red, yellow, and orange will now be a common sight all over the city’s hostels and tour agencies. This site - which is also known as Vinicunca, Winikunka, Montaña de Siete Colores, and Montaña de Colores - has blown up in popularity in the last few years and is arguably now well on its way to becoming the second most visited attraction in the Peru after Machu Picchu. That said however, for a number of reasons we were reluctant to visit, deciding only at the last minute that we owed it to you, our readers, to provide an honest review of the experience, and what to expect. So if you want to know what exactly a Rainbow Mountain day trip from Cusco involves (and whether it’s actually worth it), learn why the mountain has become so crowded, save a lot of money, and understand how to prepare for the insane Vinicunca altitude - plus appreciate some of the new realities of day tour to Rainbow Mountain in 2019 - this is the only post you need to read. We first travelled in Peru back in 2015, and were shocked only a few months after returning home to the UK when images of this spellbinding multi-coloured mountain started popping up everywhere. How on earth had we not known about it at all during our time in South America, let alone not added it to our list of things to do in Peru!? It transpired that we hadn’t been totally oblivious. The mountain had, of course, always existed but its most famous feature was hidden for centuries under thick layers of Andean snow and ice. And then, most likely due to climate change, it gradually melted away. Instead of a wake-up call to worrying environmental shifts, the region of Cusco instead discovered it had yet another world famous tourist attraction to add to its already lengthy list; the first guided tours to Rainbow Mountain started in January 2016. Its famous striped colours, vibrant in the sunshine, are largely due to weathering and mineral deposits. Previously, the standard tour to reach Rainbow Mountain involved a long early morning bus ride from Cusco and then 15 kms round-trip trek. However, with a rudimentary new road now carved into the hillside (specifically for tour buses - no other traffic would have visited before), the actual ‘hike’ portion is now a much much shorter round-trip distance of about 7 km. Unfortunately however, the early morning bus ride remains! | Hostel pick-up between 4 a.m. - 5 a.m.
| Drive back to Cusco. As you can see, it’s a long and full day with the majority of time spent driving to / from the mountain (although this is through some lovely Peruvian countryside scenes). Tours leaving at 2.00 - 2.30 a.m. are less common but will provide you with the best opportunity to skip the enormous crowds later in the day. Unless you have your own wheels, it really is not worth trying to do Rainbow Mountain independently as the transport connections required are too few and too unreliable for it to make any sense (trust us here, we always try to find independent options first for hikes and day trips and in this case). ...but check the weather forecast first! Even though rainbows usually appear after the rain has fallen, wet weather is really not your friend when it comes to experiencing Rainbow Mountain at its finest. We were blessed with pretty perfect weather for our visit in Peru’s rainy season (which runs from November - April), but speaking to others at our hostel in Cusco and on our route through South America confirmed that it can be a bloody miserable and muddy experience - and almost a complete waste of time - to do this walk in the rain and cloud. The main reason? The mountain, unsurprisingly, just doesn’t look as good when everything (and everyone) is grey, wet, and miserable. Of course, that shouldn’t come as a surprise to anyone, and there is no way that you can have complete control of the weather on any hike in South America (we’ve experience four season in a day on day hikes up in Huaraz). However, if you’re in Cusco on limited time and the region has seen a lot of rain - or rain is predicted - it’s probably best not to waste a day driving six hours to disappointment. We sometimes recommend our readers to book certain tours or experience in advance online, but that definitely isn’t the best approach in 2019 for Rainbow Mountain tours. The reason? The only tours available on trusted providers like GetYourGuide and Viator charge between $40 - $100 USD / £45 - £78 per person for a full-day Rainbow Mountain tour (thankfully, since publication, the situation has improved with this full-day tour available for around £30/$40). In Cusco however, you can quite easily find the exact same tour for S/. 55 ($16 / £13) and book it a day or two in advance! Of course, you have to make sure you’re going with an operator you can trust (check reviews on TripAdvisor) and are getting a ‘like-for-like’ package, but this really isn’t too difficult to find. We booked our tour at our hostel (called Atawkama - we highly recommend it for backpackers) at 5 p.m. the night before we went to Rainbow, and it included all transport in a good minibus and a huge breakfast and lunch which massively exceeded our expectations. The guide was next to useless, but at that price we felt we had already got decent value for money. If you’re in Peru for a short time, then by all means feel free to book ahead but we would hate to see one of you pay nearly ten times more online for the same tour somebody else on your bus paid 80% less for. The biggest mistake anyone will make for Rainbow Mountain, even more than paying $100 for the tour, is to underestimate the altitude and its impact. If you’ve heard anyone else say how much they struggled on the walk or how terrible they felt, then it’s almost certainly because they didn’t understand or prepare correctly for altitude sickness. The entire walk to Rainbow Mountain’s main summit viewpoint takes place at high altitude (starting at around 4,600 metres) and its summit is at 5,200 metres above sea level - this level of altitude is no joke and is the main reason that you’re only allowed to hang out at the summit for 10-20 minutes. If you have just arrived in Peru or have travelled directly from Lima to Cusco the day before, then your body will not be used to these conditions (namely the thin air and lack of oxygen this high up). On our tour, there were five South Korean guys in their 20s who having just arrived in Cusco from Lima the day before, were already suffering from the altitude but decided that going up another +1,000m in elevation would be a sensible idea. They were unable to do the walk without riding a horse (more on those later), and by the time we made it to our afternoon lunch stop all of them had lost their appetites, had severe headaches, were pretty dehydrated and, all in all, clearly suffering from altitude sickness. In short, Rainbow Mountain should NOT be your first hike from Cusco and, if you do the tour, we would not recommend doing it within the first 48 hours of arriving in Cusco. There’s a reason tour companies have to carry oxygen, and you don’t want to be the person to find out why halfway through the trek. Learn more about altitude sickness, and how to avoid it, in this short guide. Tip | Altitude sickness is a big issue for many people travelling in Peru. 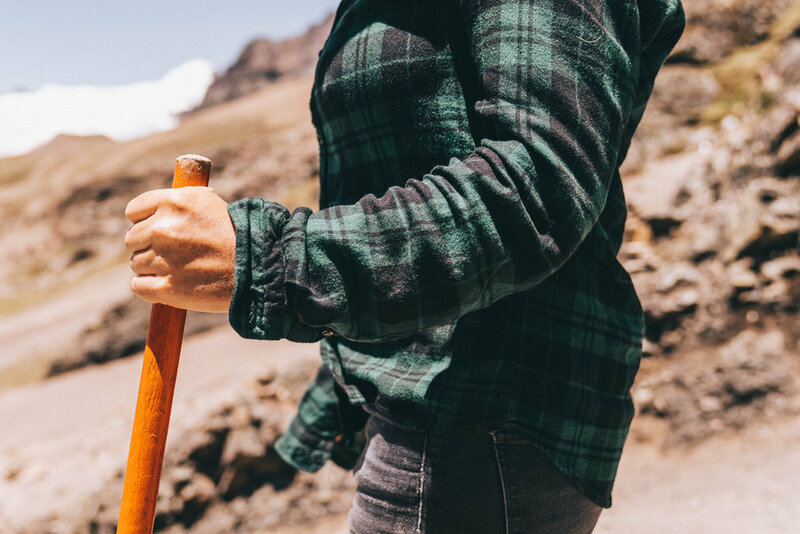 If you will be hiking at altitude then you need to make certain that your travel insurance will cover you for this activity. Many basic (i.e. cheap) policies will specifically exclude any coverage for hiking above 2,500m - 3,000m and you will need to either pay extra or find a provider which includes this coverage. Both TrueTraveller and World Nomads do provide coverage for trekking at altitude - just make sure to confirm this when purchasing your policy to give you peace of mind. Due to its popularity, Rainbow Mountain may actually be the only ‘hike’ that some people do in Peru; this is why you’ll see many people walking it in trainers and (we kid you not) flip-flops. On our Peru trip, we did about three weeks of hiking so had a lot of the equipment already with us - if you’re already packing the hiking essentials, then it makes sense to wear them. Hiking boots or hiking trainers are best (and one of these types of footwear should already be in your backpack for Peru if you’re doing it right), whilst in terms of clothes it makes sense to prepare for all weathers (and remember you’ll be leaving early in the morning from chilly Cusco) so bring layers, a waterproof jacket or packable poncho, and a hat. Suncream is essential due to the UV at this altitude and also plenty water. If you’re do plan on doing a number of hikes in Peru, then you read this 14 Things to Know Before Hiking in Peru (published soon!). Ok, so that’s most of the dull preparation stuff out of the way. Now for the fun part - it is absolutely bloody beautiful in this neck of the woods. The famous mountain (many photos of which are heavily photoshopped by the way to make certain colours pop) actually forms only one part of the attraction, as the entire valley is blessed with snow-capped peaks and ridges, plus fantastic views over Ausangate. The part that some of you may be most concerned about, due to the altitude, is the trek to the main viewpoint. The good news is that it really isn’t very far and will cause no issues for many. The dirtpath trail to the top is flat for about 75% or so, with a gradual ascent for 15%, and then quite a tough steep ascent for the last 10% or 200-300 metres. At this height above sea-level, literally everyone will feel a little breathless at the beginning and on the last 10%, but if you have an ok level of fitness and have acclimatised it really shouldn’t be anything you can’t manage at a steady pace. To give you an indication of times, we walked to the top (with a few breaks along the way) in approx. 1 hour 45 mins, and zipped back down to the bus in 45 minutes; another 30 minutes or so for the ascent and descent is probably more realistic if you’re going at a slow pace. The trail is easy to follow and most guides will simply leave their tour members to walk alone at their own pace. However, if there is a lot of rain then the trail will quickly become a slippy, slidey, muddy bog to traverse. The bad news is that a lot of people will really struggle, usually as they are unfit, haven’t followed the advice in point #5 above, or a toxic combination of the two. The micro-economy which has cropped up for the local Pampachiri indigenous community is actually wholly shaped around - and depends - upon this trend for exhausted walkers, as every day dozens in their fanciest vibrant traditional clothing will be waiting at Rainbow Mountain with horses to take people along and up (part) of the trail for a fee. We’re all for seeing local people participate and benefit directly from tourism, and for the wealth to be spread out into a community, so usually this is something we’d praise to the heavens. However, from experience, we know that the use of animals in or to support large-scale tourism always leads to certain negative practices and outcomes for the animals involved. From what we saw of these animals, they are all in good condition at the moment and that’s likely a reflection of 1. The relative newness of this enterprise and 2. That the locals use and depend on these animals for their own transport and livelihoods in the countryside. However, as daily crowds grow so will the demands (and weights) placed upon these animals. And so, we’re in a bind. No horse rides means no money and positive wider impact from the tourism here, but more horse rides also means trouble. So, if you do need to use a horse as a last resort because you are struggling, please please please make sure that it is a healthy and well-treated one, suitable for carrying your weight. One-way horse rides are offered at the start for S/. 80 (£19 / $24) - in addition to your tour price - and you will have no shortage of offers all along the trail if you look like you’re struggling. Note that you still have to walk that most challenging 10% to the Rainbow viewpoint though. And if you’re reading this and think that for weight or health reasons that the only way you can physically make it up Rainbow Mountain is with a horse, then we’d strongly encourage you to consider whether it’s safe or wise for you to be doing this tour in the first place. We repeat, 5,200m of altitude is no joke. We have saved the most important thing to know about a visit to Rainbow Mountain until the (almost) end of this post. As we mentioned right at the beginning, we were reluctant to visit Rainbow as we know from experience how these sites can often underwhelm and had preferred to spend our time doing several independent hikes and day trips from Cusco or in the Sacred Valley. However, we know a lot of you plan your own South America adventures from our blog posts, so we felt a responsibility to do it so we could let you know the realities of Rainbow. The truth is that, in the three short years it’s been a tourist attraction, Rainbow Mountain has fallen victim to the lethal blend of Instagram’s influence and Peru’s existing levels of tourism. From being on literally nobody’s radar to near the very top of everyone’s must-sees in Peru in that brief time scale points to a worrying trend for the sustainability of this and many other tourism attractions around the world. Overtourism isn’t just a future concern, it’s already here at Rainbow Mountain. Visiting in the early December low season, we learned from our guide that we were lucky as we would ‘only’ be sharing the trail with 500 people, rather than the 3,000 to 4,000 who can make it here IN A SINGLE DAY in high season thanks to the new road, cheaper tour prices, and increased demand from the social media’s non-stop promotion of the site. Our jaws literally dropped when he told us that figure, and our hearts sank a little too. Rainbow Mountain is actually quite a small site with a single access trail for all walkers, and it simply will not be able to cope under that strain for too long nor remain an enjoyable experience. Already, the mirador is is far too crowded due to tours arriving at the same time and nearly every single shot (including ours) you’ll see on social media will obscure the fact that there were people in front and behind waiting. These realities won’t come as a surprise to many of you, but it’s something many articles promoting Rainbow Mountain completely neglect to mention. Add in all the other negative impacts of that ridiculous daily footfall (increased litter, lack of sanitation facilities, mistreatment and overworking of the horses, irresponsible walkers going off-trail), and it is crystal clear to us that the Peruvian government simply has to take action soon (as it recently did by blocking mining rights in the area) rather than later to limit the number of daily visitors and ensure that the area is not overwhelmed and, ultimately, desecrated. We know that a number of locals now depend on this tourism economically (both in the restaurants tours stop at and via the horse rental) so we hope a sustainable balance can be found. With that in mind, we want to emphasise that we aren’t telling you not to go to Rainbow Mountain, but rather giving you more honest insight than you may find elsewhere so that you can manage your expectations and make your own decisions. We genuinely only went to Rainbow so that we could give you an honest opinion (see our Instagram post on this), and that’s what we hope to have done here. There’s definitely a pot of gold at the end of Rainbow Mountain for somebody, but much of its treasure is already tarnished. And if that has left you despondent or questioning whether you want to do this particular day trip from Cusco, as it should for any responsible travellers, then it’s worth noting that there are a few excellent alternatives to Rainbow Mountain which will take you away from the crowds but still allow you to see the same or similar multicoloured ranges. You won’t be able to get that shot, but it might just give you a more enjoyable experience overall. The main alternative to Rainbow Mountain, a day trip to Palcoyo from Cusco, involves a much more reasonable start time (7.30 a.m.), far fewer crowds, a hike at altitude, and incredible scenery of three rainbow coloured mountains. 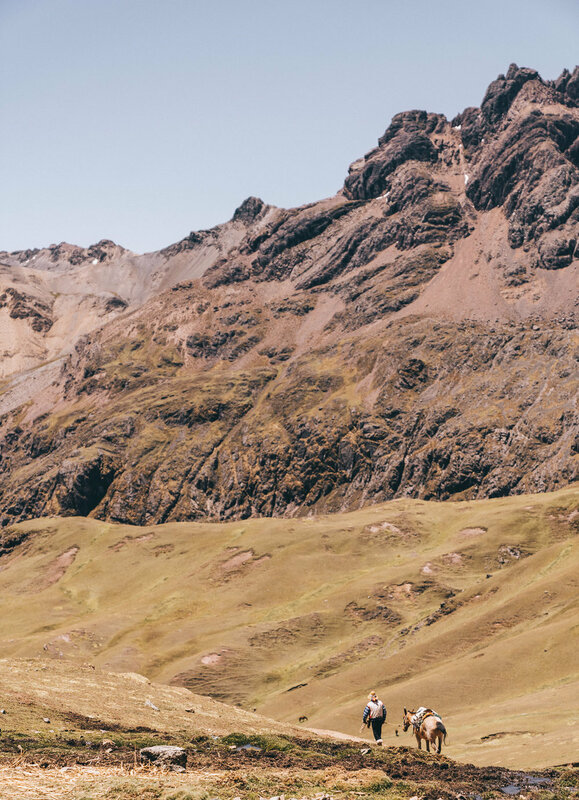 An eight-day, 69 km trek that runs through one of the most beautiful landscapes in the Andes. Starting at 12,000ft and reaching high passes close to 17,000ft. 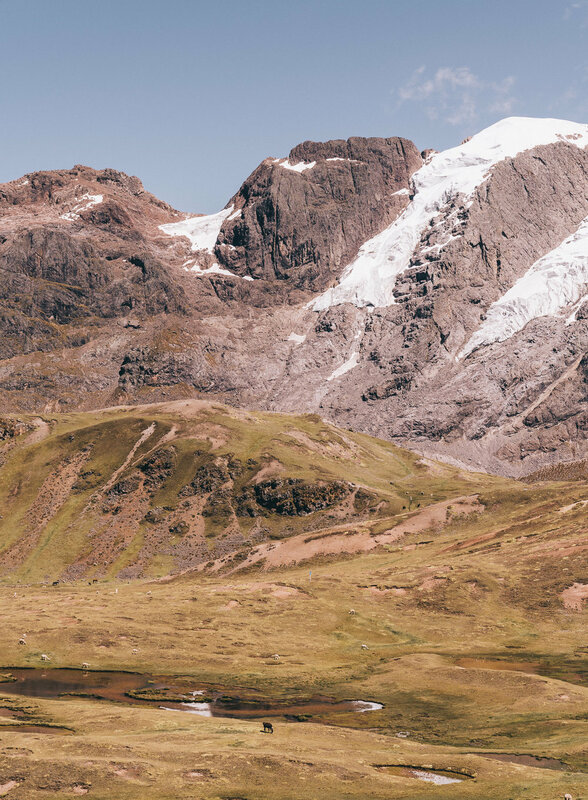 It’s beautiful and remote, retaining that rugged sense off an off-the-beaten track adventure which will bring you through the Ausangate region and very very close to Rainbow (a short visit to it is actually possible) as well as a whole set of wonderful landscapes and glacier lakes. Although often part of the same Rainbow Mountain day tours, not all agencies offer the opportunity to walk the extra 2 - 2.5 hours through the less crowded Red Valley. Doing this may make the overall day trip experience more worthwhile and memorable, but we imagine that this specific trail may well become as popular as the original loop. If you don’t now feel like Rainbow Mountain is something you want to visit whilst based in Cusco, then consider some of the other best day trips from Cusco. Whether you choose to visit Rainbow Mountain or not, as ever be considerate of the surrounding area and local communities, be respectful of the site, make memories and leave only footprints.